We started this series with a meditation on the word vayinafash, God was "re-souled" on the 7th day. How have you made a commitment to being "re-souled" this month? I (Rabbi Ariann) have spent time with children, have participated in MLK Day celebrations at the Newark Museum, have marched on Washington, and yes, I have celebrated Shabbat as well. I (Rabbi Elliott) have snowboarded in Idaho and refreshed my soul at a retreat with the Institute for Jewish Spirituality, and yes, I have also celebrated Shabbat. This week we're going to focus on ways to re-soul others. The video describes the practice of blessing children around the Shabbat table, which is traditionally done after lighting candles and before kiddush. It may be a radical idea to some of us that we even have the power of blessing. Judaism, from the earliest moments of the priesthood described in the Torah through today, has always emphasized a place for a personal blessing practice. Judaism teaches that humanity carries the godly power to be conduits of blessing. We share this belief with many faith traditions, although we may use different language to convey it. 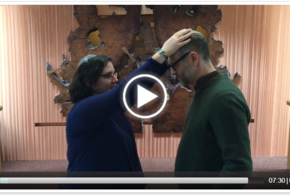 In the video, you'll learn about new and old ways to bless your children at the Shabbat table. But if you are enjoying Shabbat alone or with friends, this blessing opportunity is still available to you. Please use the language of our tradition or the Buddhist metta blessing also taught in the video to bless yourself, to bless your friends, to bless your neighbors, and to bless those you're thinking about who aren't with you physically. We hope to see you on Feburary 3rd for our special Soulful Shabbat, the culmination of this month of taking on new and old Shabbat practices. Welcome to Week 3! So far we've lit candles and blessed wine and now it's time to EAT! How many of us simply eat to live? I (Rabbi Ariann) know I don't. I eat to celebrate, to mourn, to enjoy company, to fill space, and yes, of course, to live. The Sabbath meal has traditionally included all of the elements of "joyful" eating our tradition could think up: wine, meat, and bread. All of these elements were expensive and "special," and therefore a sign that Shabbat was really a central value of the Jewish home. Stories abound of miraculous appearances of the Prophet Elijah bringing a Sabbath meal to an impoverished home, always just in the nick of time. The goal of Shabbat food was not simply to feed a hungry belly, but to step beyond the barest needs of eating to survive, and experiencing the possibilities of actual "calling Shabbat a day of delight" (in the words of Isaiah). For the rabbis, that meant having the nicest food available. What does it mean to have the "nicest" food now? The exorbitantly priced gluten-free treat you never buy for yourself? Your favorite fruit you avoid because it's shipped all the way from New Zealand? Just a simple challah, with a simple soup and a simple salad? The food you can get on the table without experiencing performance anxiety? Perhaps you have to exclude wine or bread from your meal to preserve your health, or choose to exclude meat. Or perhaps you get to have all of these things any day of the week and it's hard to recreate the delight an impoverished home could experience in a simple loaf of bread. But perhaps with the kavanah that Shabbat is a "taste" of the world to come, even the most mundane things can be newly delightful. We hope you'll join us for a simple Shabbat supper before services on February 3rd.We'll share the blessings we've practiced over the past few weeks and break bread together, have a Soulful Shabbat service featuring our BK Band, and have moments along the way to share blessings again even if you missed dinner. If you are so moved to make our Shabbat truly a delight, please contribute to our oneg Shabbat (post-service dessert) by bringing a baked good from home with an ingredient list (please no nuts). Gluten-free and other allergy-aware desserts are especially welcome and will be served on a separate table. Welcome to week 2 of our Soulful Shabbat series. This week we are making kiddush and sanctifying the day of Shabbat. While the full Hebrew text of kiddush is more challenging than that of lighting candles, do not fret! Feel free to sing just the short one line blessing over wine, or to recite the prayer in English translation. Whether we say kiddush every week or are doing it for the first time, we are all always on a path of learning. Some say we use wine for this ritual to remember the wine libation of the Temple, others say wine just reminds us to be joyful, and still others say that wine reminds us of weddings and Shabbat is a mystical wedding between God and the Jewish people. The explanation I (Rabbi Ariann) like the best, though, goes like this. It takes 7 years for a vineyard to produce wine-quality grapes, and thus wine is a symbol of being rooted to place and time. Wine points uniquely to the Jewish community landing in a place and staying put. If wine is a symbol of our freedom to build homes and plant vineyards, it is the perfect vehicle for us to declare: Shabbat reminds us of an orderly Creation, where rest and rejuvenation are woven into the very fabric of time from the beginning and also, Shabbat also reminds us of our profound freedom from slavery and our ability to not only claim a right to rest, but to assert it. Kiddush (which means "sanctification") is a moment of transformation. While candle lighting brings in Shabbat, kiddush is a moment of saying "this is why we're here." It layers consciousness on top of action. If you don't enjoy or have wine, grape juice makes an excellent substitute, and in a pinch, beer, apple juice, or even water will do. But wine or grape juice is especially nice. You can practice the long form of the Reconstructionist kiddush by clicking here. It's time for our first Soulful Shabbat installment: Lighting Candles/Making a Separation. If you're an absolute beginner at lighting candles, then your challenge is clear: just get them lit! Use traditional candle sticks and candles, tea lights, or even improvised oil lights (you need a glass, a weighted wick which can be made of twine or thick cotton string, and some olive oil). We are all beginners at one point or another. This week, the two of us were beginner videographers. Like you, we will improve! Feel free to read the blessings in Hebrew or in English, whatever makes you more comfortable. Here is a very slow primer on singing the blessings in Hebrew. If you are a regular candle lighter, or a semi-regular lighter, what can you do this week to bring more a greater intention to your lighting? 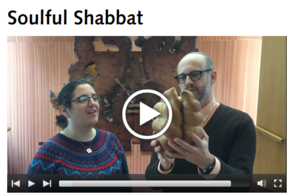 How can you more fully separate yourself from the work of the week and Shabbat? How can you be more present to appreciate the light of Shabbat entering your home? You may choose to add a kavanah (a spoken intention or prayer) to your candle lighting practice this week. Trisha Arlin's "We Must Pray and We Must Do"
Blessed is the match that's consumed in kindling a flame. Blessed is the flame that burns in the secret depths of the heart. A chance truly to rest on this Shabbat. The spirit of anger, the spirit of harm. That they may walk in the ways of your Torah, your light.